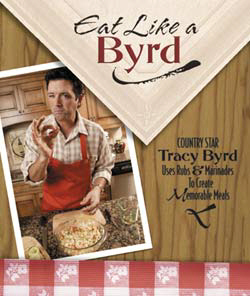 On the cover of Eat Like A Byrd it says, "Country Star Tracy Byrd uses rubs and marinades to create memorable meals." This is quite true but it isn't only the recipes that are memorable. This delicious collection of appetizing, easy to create, meals is also an engaging and fun read. There are many informative personal notes by Byrd about the recipes, his life with his family, and his life on the road as an entertainer. The book has many beautiful photos as well. This is not just a cookbook, this is an invitation from one of the finest entertainers in country music to sit down at his kitchen table and get to know him and his family. In the introduction, Byrd reminisces about being a part of "small town America" where the kitchen is the heart of the home and time spent there was/is as much about bonding with family as it was/is about cooking. When he recalls "precious memories preserved in the form of index cards or scraps of paper with handwritten recipes from grandma's kitchen," I immediately thought about my own recipe box -- over flowing with cherished recipes that have been passed down through our family for generations -- some of them so worn from use that I have put them in plastic sleeves to keep them from disintegrating any further. Rewriting them is not an option since each pen stroke, smudge, splatter, accidentally added ingredient tattoo or smear, contains a piece of our family DNA. This is the gist of the Eat Like A Byrdcookbook. It is not just about the great recipes; it is about family values and delectable life lessons served up, with love, around the family kitchen table. The book is cleverly written and sufficiently entertains as it educates; sometimes with humor. When Byrd defines "rubs," he says, "You don't need to be exact," and then adds, "if you run out of one thing, just mix in something else, taste it, and if it works go for it." His cooking logic and method of instruction is the hallmark of all fine "down home" cooks. Throughout the cookbook Byrd offers up menu suggestions, conversions tips, recommends various spices, which utensils to stock, which pots and pans you will need, and a wide variety of miscellaneous helpful hints. He provides a bounty of "Tracy's tips." The final tip on the last page of the book is "Remember to have fun in the kitchen." If you Eat Like A Byrd, the fun is a given. Byrd says that seasonings and spices are critical to making a good meal great. To that end, he has created his own line of spices based on family recipes. His cookbook and Tiny Town line of seasonings and marinades should be available at your local Wal-Mart in the very near future. If you do not see them, ask for them. In addition to all the other information in the cookbook, there are 120 delicious recipes, all ranked by Tracy according to degree of difficulty of preparation. This cookbook is one of the best I have seen and is sure to get lots of use whether you are a novice cook or gourmet chef. Emeril may have the "bam" but Tracy Byrd has cornered the market on cooking charisma and it won't be long before everyone is happy to Eat Like A Byrd. A portion of the proceeds from all sales of the cookbook benefits Children's Miracle Network. If you cannot find the book in your local Wal-Mart, you can purchase it from Tracy 's official website. Purchase the book by Clicking Here and a $5.00 contribution will automatically be made to Children's Miracle Network.